This entry was posted on November 24, 2008 at 9:23 pm	and is filed under Desserts. 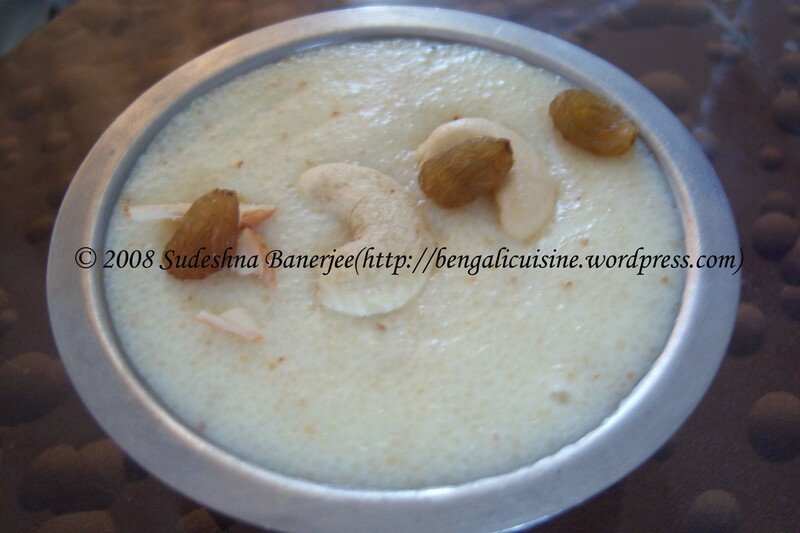 Tagged: bangla ranna, bengali ranna, Bengali sweet, dessert, kaju, kismis, payes, payesam, payesh, pujor ranna, rava halwa, rava kesari, semolina, suji. You can follow any responses to this entry through the RSS 2.0 feed. You can leave a response, or trackback from your own site. That was so heart touching. yeh I definitely know about Bipattraini puja, my mom sends me those red threads every year, wherever I am. I hope you’ll be able to have sujir halwa, its very simple and just follow the steps. Do let me know, how it tasted, I would be eagerly waiting for your reply. And of course thanks a lot for pouring in your thoughts. It means a lot to know how my readers feel.